Introducing a NEW LOOK to the Lamb Brand Victorian Sponge Mix. We gave this classic product a new modern look, with an improved recipe. This Lamb Brand traditional Victorian Sponge Cake Mix is a baking classic everyone will love and it takes only a few minutes to make. It is definitely a tasty teatime treat and makes the perfect party cake all the time. Being so easy to prepare, our Victorian Sponge Cake Mix is the best you will ever taste. Perfectly moist with a touch of sweet, it is ideal for creating a special birthday cake or simply delicious cupcakes that will leave you craving more. 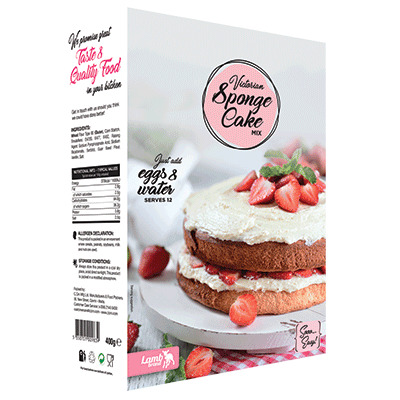 Try out this sponge mix by following these easy steps and have your Lamb Brand Victorian Sponge Cake ready in no time! Heat the oven to 180*C. Sift the Victorian Sponge Cake Mix to let in air, and add the remaining ingredients in the sieve to the mixture. Beat eggs in a separate bowl and then add water and mix at medium to high speed for 2 minutes until mixture becomes fluffy. Add the sifted cake mix to the mixture, and whisk for another 6 minutes at high speed. Turn into a greased 30cm cake tin and bake for 35 - 40 minutes until an inserted skewer comes out clean. Allow to stand for 5 minutes before tuning on a wire rack to cool.